Virginia Apgar came into this world on June 7, 1909. 109 years later, her presence can still be felt in delivery rooms across the globe. That’s because she invented the Apgar score, the first standardized method for assessing a newborn’s health. It looks at 5 factors, which doctors remember by spelling out her last name: appearance, pulse, grimace, activity, and respiration. Apgar first came up with this scoring system in 1952, and it has been used in nearly every hospital birth since. Before Apgar’s life-saving invention, she already had a number of impressive accolades under her belt. She was the first woman to become a full professor at her alma mater, the Columbia University College of Physicians and Surgeons, and was the director of the school’s department of anesthesiology. After Apgar left Columbia in the late 1950s, she devoted the rest of her years to the prevention of birth defects as a director at the National Foundation for Infantile Paralysis (now the March of Dimes). Today, on what would’ve been her 109th birthday, we celebrate a woman whose incredible life’s work continues to touch – and sometimes save – brand new lives every day. The Search Engine Google is showing this animated Doodle in many Countries for Dr. Virginia Apgar’s 109th Birthday. 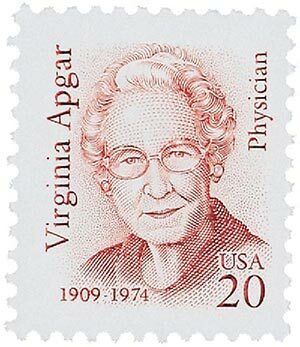 Virginia Apgar was an American obstetrical anesthesiologist. She was a leader in the fields of anesthesiology and teratology and introduced obstetrical considerations to the established field of neonatology. To the public, however, she is best known as the inventor of the Apgar score, a way to quickly assess the health of newborn children immediately after birth. Being the youngest of three children, Apgar was born and raised in Westfield, New Jersey to a musical family. By the time she graduated from high school, Virginia Apgar was determined to be a doctor. She may have been inspired by her father’s scientific hobbies, or by her eldest brother’s early death from tuberculosis, and another brother’s chronic childhood illness. With the help of several scholarships, she attended Mt. Holyoke College, performing in the college orchestra as a gifted violinist and graduating with a major in zoology in 1929. In 1933, she graduated fourth in her class from Columbia University College of Physicians and Surgeons. She was discouraged by Dr. Allen Whipple, the chairman of surgery at Columbia-Presbyterian Medical Center, from continuing her career as a surgeon because he had seen many women attempt to be successful surgeons and ultimately fail. He instead encouraged her to practice anesthesiology because he felt that advancements in anesthesia were needed to further advance surgery and felt that she had the “energy and ability” to make a significant contribution. Deciding to continue her career in anesthesiology, she had taken various training to be an anesthesiologist. Apgar realized that the period just after a baby is born is an extremely important time for many infants. At the time babies were not usually evaluated carefully at birth by doctors, who were often more concerned with the health of the mother. Because of this lack of an organized examination, many life-threatening conditions were not identified in infants. To provide a quick and efficient way to decide which babies required special care, Apgar created a five-part test that scored a child’s heart rate, respiration, muscle tone, color, and reflexes. The test, known as the Apgar Newborn Scoring System, was to be performed one minute after birth. This later expanded to five and ten minutes as well. Developed in 1949, Apgar’s system eventually became a worldwide standard among physicians for determining a child’s chance of survival and rate of development. During her lifetime Apgar made significant contributions to science not only in the laboratory but also in the classroom. She instructed hundreds of doctors and left a lasting mark on the field of neonatal care. Apgar received a number of awards recognizing her role in medicine. Dr. Virginia Apgar (1909-74) was largely responsible for founding the field of neonatology, the area of medicine that specializes in premature and ill newborns. Apgar is best known as the developer of the Apgar test. Her method of assessing the health of newborn babies greatly reduced infant mortality worldwide. Apgar is pictured on the 20¢ Great Americans stamp. The series is characterized by a standard definitive size, simple design, and monochromatic colors. The Bureau of Engraving and Printing produced most of the stamps, but some were printed by private firms. Several stamps saw multiple printings. The result is many different varieties, with tagging being the key to understanding them.